Among the four-nerve daisies (Tetraneuris linearifolia) that I photographed on Bluegrass Dr. on January 29th, I noticed one bud that had folded in on itself in an unnatural way that I’d never seen in this species and that might have been an instance of fasciation. If you’d like, you can compare the way a four-nerve daisy bud normally opens. You can also click the fasciation tag below to scroll down through previous posts showing other afflicted species. 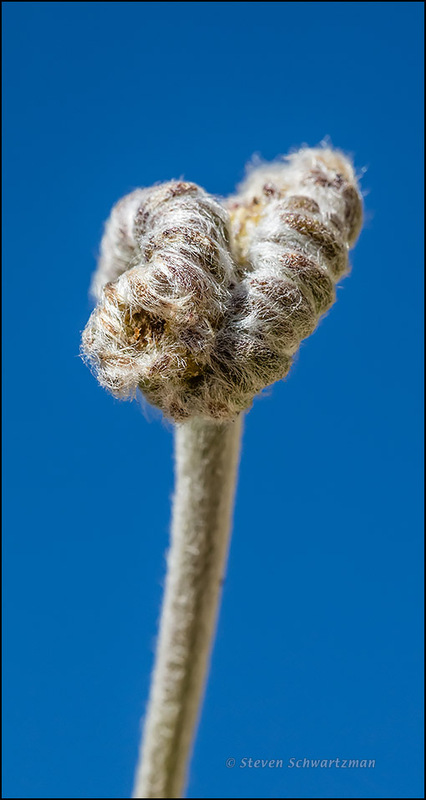 Looks like a “blossoming” fiddlehead. I never made that connection, but you’ve got a point. As soon as I saw the word fiddlehead I thought that Nero is said to have fiddled while Rome burned. Aye, that he did, but not with a cinnamon fern. 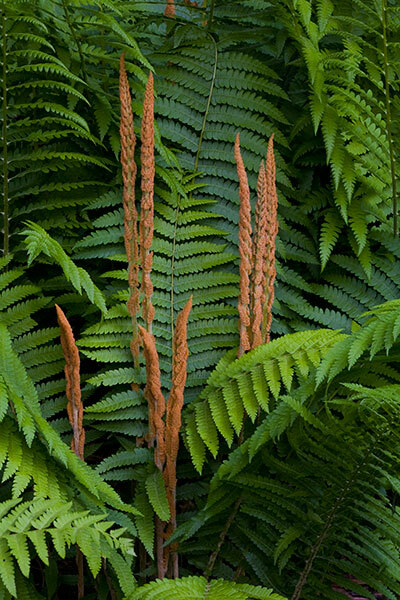 I’ve photographed a cinnamon fern only once. It was in east Texas about 17 years ago. I wish they grew in Austin. I just looked at the USDA map and found cinnamon fern attested for two counties adjacent to mine on the east, so maybe I’ll get to see one again after all. I always thought they were pretty widespread. I hope you have them nearby. That’s a great Youth picture, with all the fine hairs. You must be proud of your work. 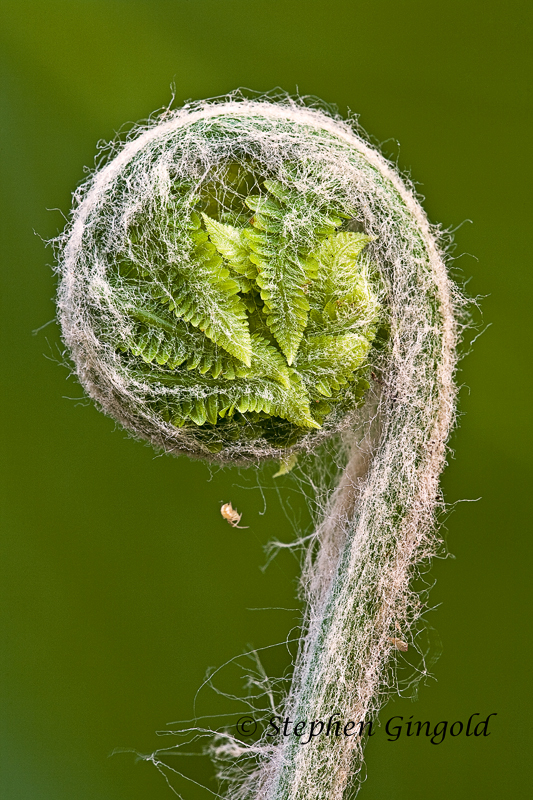 I can see why this daisy bud reminded you of the fiddlehead. I searched on your blog but you seem not to have posted that fiddlehead picture there. You might keep it in reserve for a time when it’s not easy to go out taking new pictures. Yeah, I had to add them to the library to share. Now that they are there, I guess it is a little something saved for a rainy day. Wonderful image, Steven. Great texture! Almost like fur on an animal, isn’t it? Despite the fuzziness and other differences, when I first saw this, the shape reminded me of the seed capsule of the rain lily. I suppose it’s the way it’s so neatly tucked up there at the top of the stem. Once I’d looked at the properly-opening bud, I remembered the discussion of merlons and crenels, and could see the crenellation here. From a different perspective, it looks rather like hair done up in a French twist. Did you happen to go back, to see if it ever opened properly? No, I never did go back, and if I tried to check now I could probably find the spot but I don’t know if the bud would still be there. I can see the high-up-on-a-stalk-ness that reminded you of a rain-lily, even if that’s smooth and this is hairy. Speaking of rain-lilies, the best colony of them that I relied upon for photographs these last few years has become a construction site alongside Mopac. I’ve been wondering to what extent (if at all) the colony will spring back up once construction ends. The project was supposed to have been completed this past fall but is already a year and a half behind schedule. Ah yes, the fascination of fasciation. The WordPress editor doesn’t think the second of those two similar words is real, but what does it know? Sometimes the WP editor acts as if it is fasciated. Which meaning of fascia did you have in mind? Mother Nature is giving us the fist. You might say this is a different version of Flower Power. So you experienced a fascination with fasciation even before you knew there was a name for it. I want to say that the phenomenon isn’t common and yet it’s not uncommon either. And speaking of common, the four-nerve daisy is small and probably many people don’t pay attention to it, yet it’s quite common here and can be found flowering for much of the year. A look through a macro lens adds to the appreciation of this wildflower, as you saw from the view of the way it opens. Let’s hope you find some examples of this phenomenon on your side of the world. The fasciation, or twisted nature of the flower, looks like a painful, arthritic joint. Oh, I hope you’re not speaking from experience. That’s at least a partial exemption, but when things happen to those we care about, of course we’re affected too.